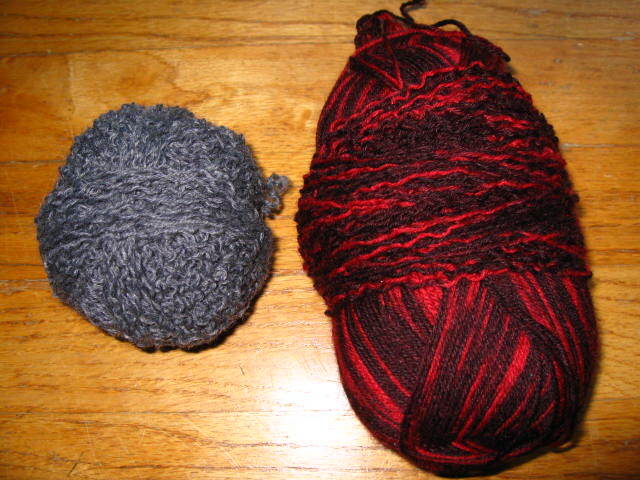 For the past year, two socks, of different yarns, have been resurfacing like flotsam on my bins of creative fodder. 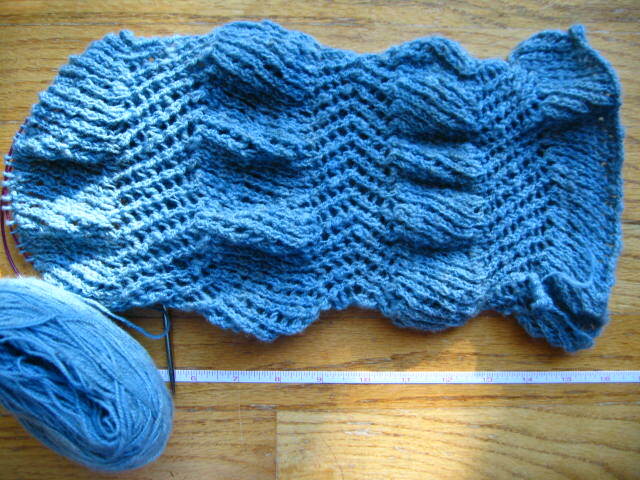 They were started at a time when I thought it would be fun to knit on needles of size 1 or less. 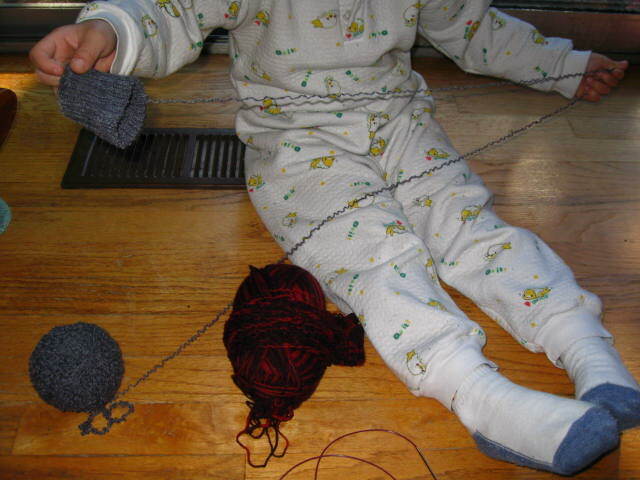 But I encountered two problems using small needles: it takes forever to knit anything up when your stitches are tiny, and my hands cramp easily when wielding those needles. I decided I would put an end to the taunting of the socks and the dreaded SSS (Second Sock Syndrome). 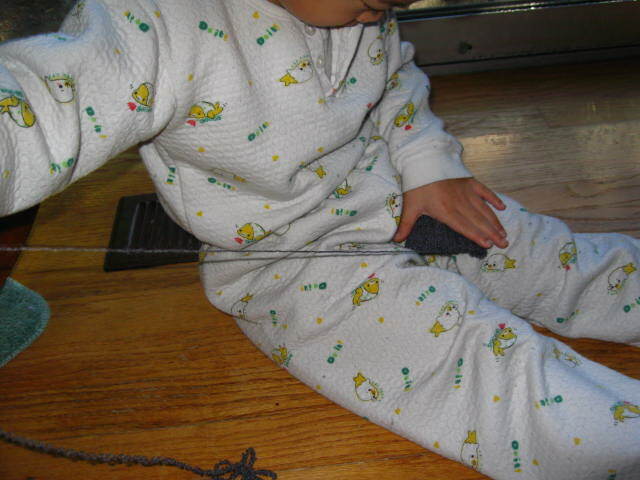 My son loves to frog my knitting, indeed, he feels it is his perogative. (He feels the same about cutting any weaving off my looms, so I have not yet had that pleasure.) So my year of work kept him very well entertained for a few minutes. 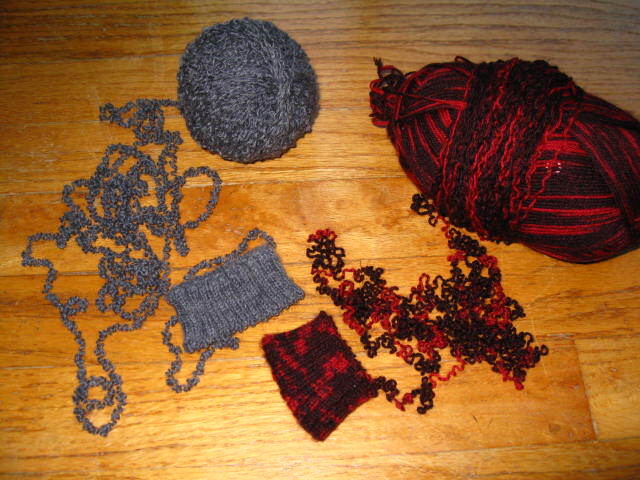 The variegated red and black yarn is Opal, of the famous Roxy stash. The striping of the socks did not show off the cabling detail I had chosen for the sock, another good reason to start over. 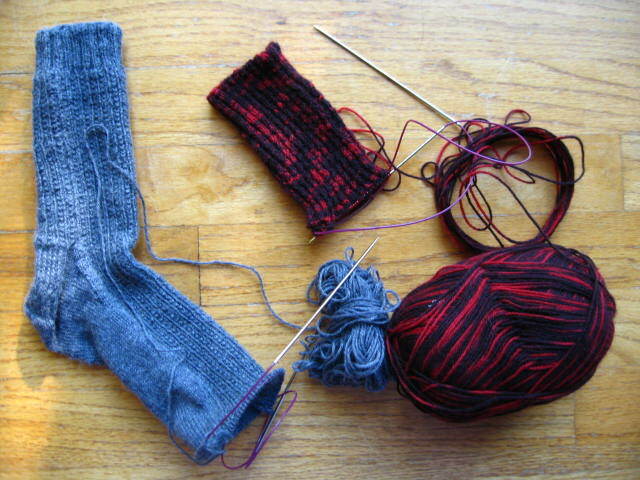 I will re-knit the socks, but the next time, I plan to knit them up two-at-a time, on one (larger-sized!) long circular needle. 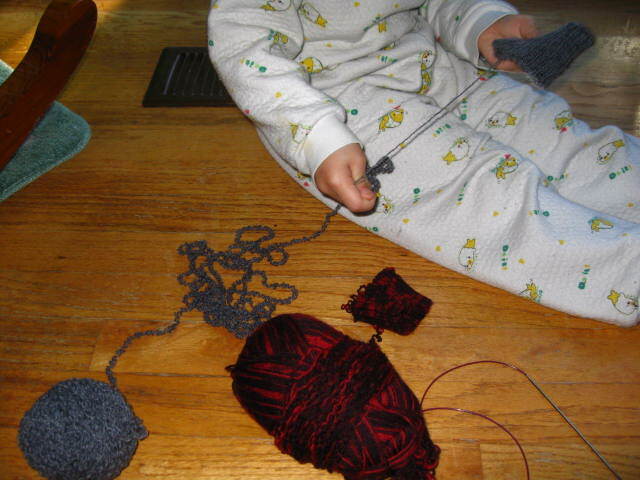 And because the Opal yarn is for two socks, I’ll have to muddle through knitting from both ends of the ball at once. My son takes a fifty-minute soccer class once a week. Because of that, I actually have some dedicated knit time, as well as a WIP that is actually being worked on consistently; I’m using Véronik Avery’s ruffled scarf pattern from “Knitting Classic Style”, an wonderful pattern for a first-time lace project, and an excellent exercise in learning the difference between left- and right-slanting decreases. The yarn is my own hand-dyed, handspun, and hand-carded mixture of rambouillet and cashmere. The way things are going, it looks like I may run out of yarn before the scarf is long enough to go around my neck. There’s a glaring mistake I chose to ignore (smack dab centre), since after frogging the first two inches five times, I decided finishing was more important than fixing it.